Properties for sale in Brittany, France - AHIB-2-ME-2124 Josselin 56120 Gorgeous 4 bedroom house in heart of town. 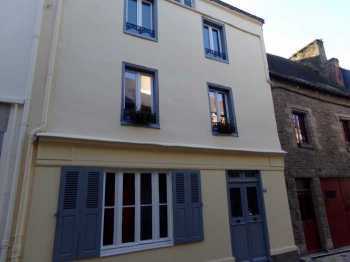 AHIB-2-ME-2124 56120 Josselin Gorgeous 4 bedroom house in heart of town. Located in the heart of Josselin, only a few steps away from the Chateau with its charming grounds, the Nantes Brest Canal is a short walk away and the cafes , restaurants, bars are all on the doorstep, this beautiful property has so much to offer. Set over four floors the house is steeped in charm and elegance. On the ground floor there is a generous sized open plan lounge, kitchen and dining area. The ground floor also benefits from a WC. On the first floor you will find two bedrooms and family bathroom. The second floor offers a further two bedrooms and the most lovely landing area. On this floor you will also find a shower room. The attic is ready for development should you wish. The property has been sympathetically restored and will make the most beautiful home. Transport links to Josselin are excellent. The area has so much to offer, from water sports on the Nantes Brest canal, the beaches of the North and South can be reached in an hour, not to mention the history of the local area and the Arthurian legends of Brocéliande.